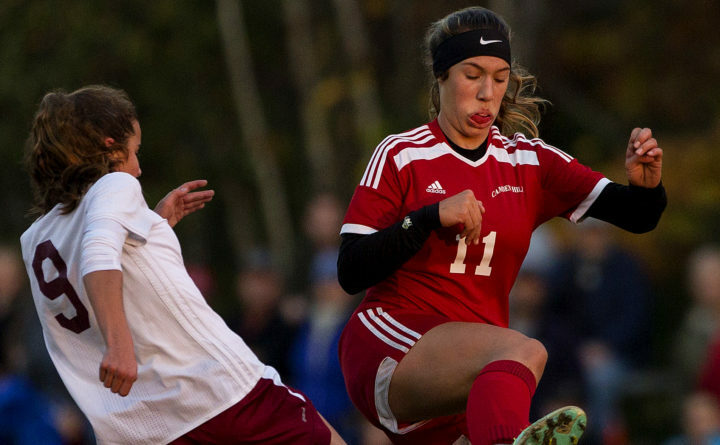 Camden Hills' Kaylyn Krul tries to stop a clear from Bangor's Eliza Jansujwicz during a girls soccer regional championship game at Bangor. Kassie Krul said that during the summer of 2017, she played in a showcase tournament for her Dutch Soccer Academy club team against an outstanding New York team. The All-Region I midfielder has helped lead Camden Hills High School of Rockport to back-to-back Class A soccer state championships. One of the coaches there was Thomas Goines of NCAA Division II Barton College in Wilson, North Carolina. After the game, Goines talked to the team’s coach, Tammy Krul — Kassie’s mother. Tammy and Kassie eventually went on a recruiting visit to Barton, and it made a lasting impression on Kassie. She will attend the school on an athletic scholarship starting in 2019. “I’m really happy I was able to find the right fit for me,” Kassie Krul said. “It is exactly what I wanted from a Division II school. The campus is good size for Division II, they are building an on-campus turf field and receiving a full scholarship is huge. “To not have to pay anything, and to graduate debt-free is really big,” said Krul, who is highly skilled and versatile, controls the midfield with her ball skills and can be a creative playmaker or a goal scorer. Krul said she was impressed by Goines and his persistence in recruiting her and she also liked the Bulldogs’ style of play. “They play a possession game and they’re intense,” said Krul, who had 10 goals last season for the Windjammers and is off to another strong start for the team (3-0) this season. “There is also a balance between soccer and school. I don’t feel I’m a Division I player. Division I is very physical, and I’m more of a technical player,” Krul said. She explained that her NCAA official visit was not overwhelming and that she felt comfortable at Barton. Krul said the school is a long way from home, but a new direct, low-cost flight from Portland to Raleigh, North Carolina, which is 50 miles from Wilson, will make travel convenient for her. “I’m so confident in my decision,” said Krul, who also checked out a lot of Division III schools in New England. Division III schools aren’t allowed to award athletic scholarships. Barton, which plays in Conference Carolinas, is off to a 3-1 start after posting an 8-8-3 record last season.